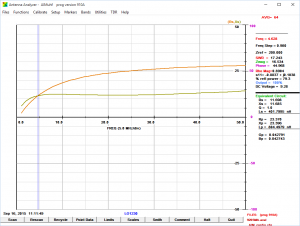 Of interest in the first instance is the apparent inductance of the single turn winding at low frequencies where typically permeability µ is fairly constant and core loss is fairly low. 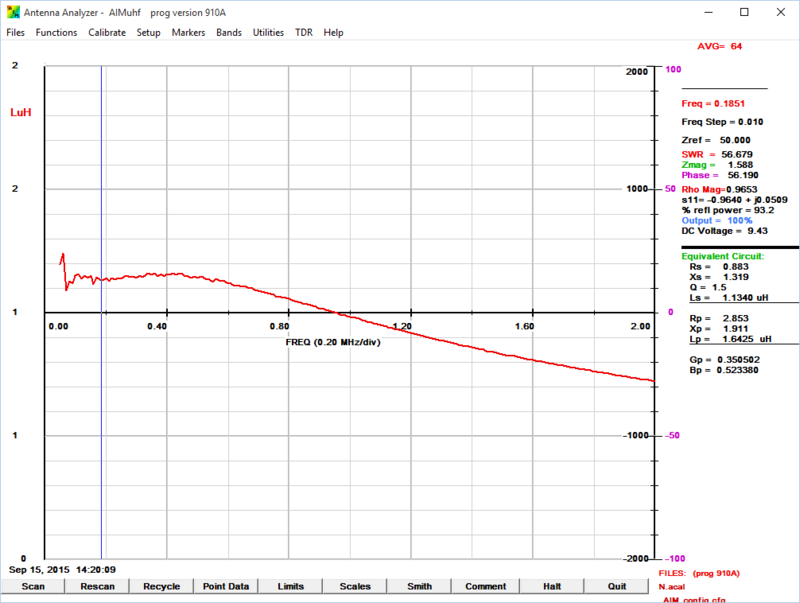 Above is a plot of inductance from 0.1 to 2MHz. 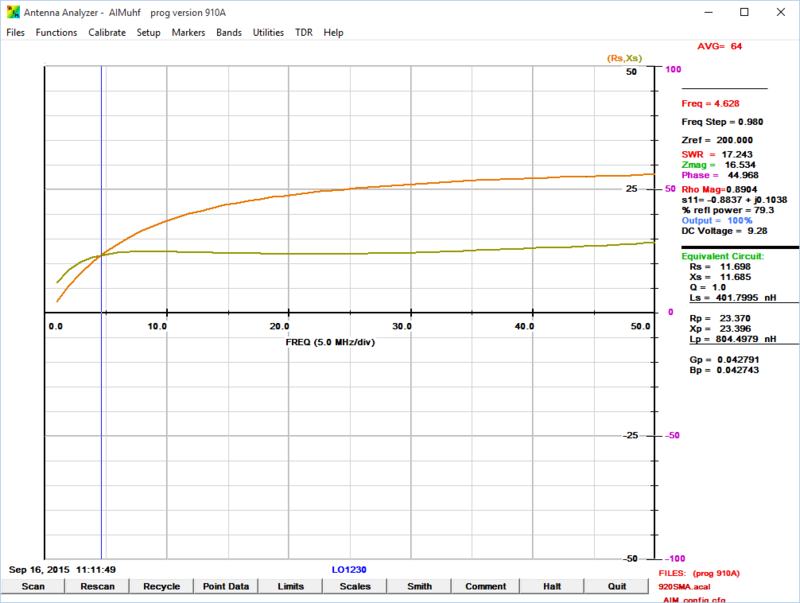 The AIM software is pretty poor, and one of the many defects is that the L axis labels are confusing as they have been erroneously rounded to a single digit, but the cursor values to the right show that the inductance at the low frequencies is about 1.1µH. 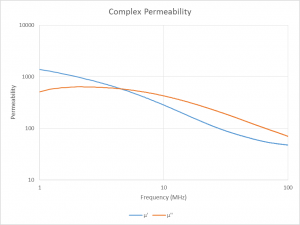 We can directly calculate the initial permeability µi given the low frequency inductance and core dimensions, or work backwards iteratively with a calculator such as above. The value of µi is rounded to 1500 for a nominal value that might appear in a material datasheet. Since this is only one turn, the constant Al for this core is equal to the inductance, 1060nH. 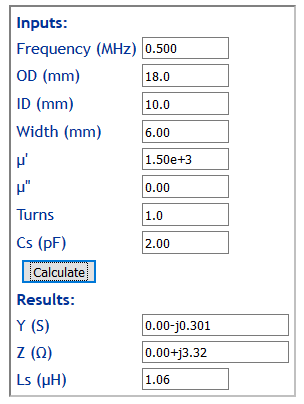 Lots of calculators use Al to calculate inductance and reactance of toroidal ferrite inductors, but as can readily be seen from the first graph, µ holds constant up to only 0.5MHz and any calculation above that frequency needs to include not only the variation in permeability with frequency, but the growing significance of the complex component of permeability which expresses the core loss (µ’ and µ” respectively). 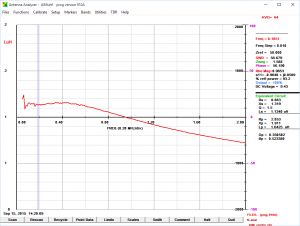 Above is a plot of the impedance of the single turn winding from 0.1 to 50MHz. 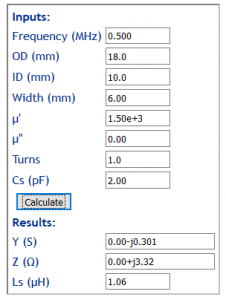 We can calculate the complex permeability µ’+jµ” from the inductor details and that impedance data. The frequency where R=X or µ’=µ” is an interesting one, combined with µi it is a useful short signature that can be used to identify / classify common materials. 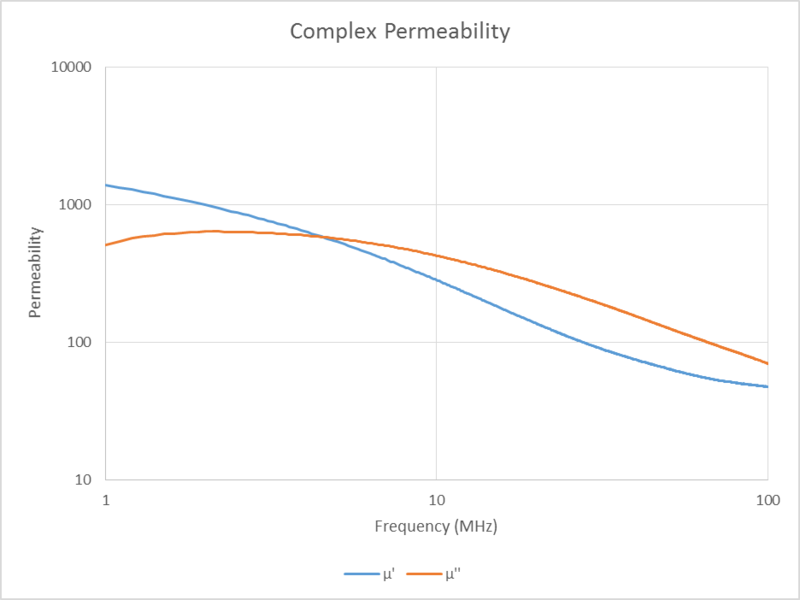 Above is the calculated complex permeability for the ferrite material. Over the range 1 to 50MHz, it is a quite low Q material (Q=µ’/µ”), so whilst it might be used in chokes and EMC suppression applications, it would not find much use in tuned circuits in this frequency range. It is similar to Fairrite #31 mix, not identical but quite similar and probably also a MnZn ferrite. The ‘unknown’ core is actually a Jaycar LO1230 which is specified to use L8 material. 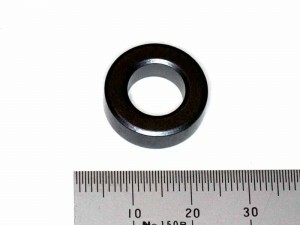 L8 is also used in their LO1234 25x15x10 toroid which has Al of about 1500nH.